The ARP Control protects your RV fridge. Download current ARP manual here. Also register ARP Control and see how to install ARP Control and operate RV fridge. Keep your original purchase receipt and register your ARP Control within one month of the purchase date. All post-sales support requires registration and submission of your control serial number on the Contact Us form. Please note that when you receive your new Fridge Defend controller, the PACKING LIST has the serial number written on it. The packing list image shows an example of the serial number highlighted in yellow. Please fill out the form below and submit it within one month of your purchase. Your control will have a serial number written on the packaging the control came in. Further, the SetUp Mode on your control will display the serial number, please reference the Troubleshooting Guide and/or the Ancillary Graphical User Instructions for retrieving the serial number directly from the controller's SetUp mode. The email address used below must be the same as the email address that was used during purchase of the product. All support requests must use this same email address to establish ownership of the product when requesting support from ARPC LLC. Do you have a aftermarket cooling unit? 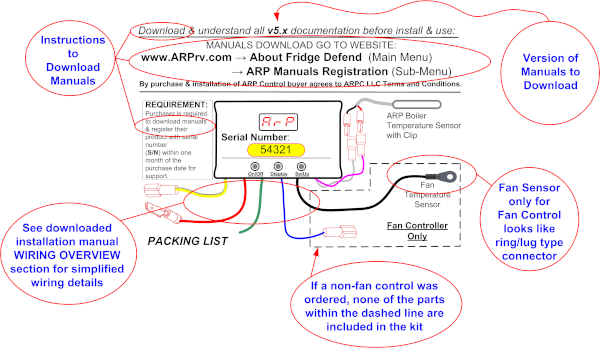 Example: Amish - Nordic - RVCool - .... Fridge Model (ID tag in door jamb of fridge) ARP Control Serial Number Where Did You Purchase Your ARP Control? Example: www.ARPrv.com Manufacture of RV? Winnebago - Monaco - ..... Model of RV? Thank you for your purchase of the ARP Control!